The 5th (and final) generation El Camino was launched in 1978 on a platform shared with the Chevy Malibu, but technically on its own unique El Camino chassis. The base engine was a V6 (for the first time -- previous versions used inline-6 or V8 power) and the styling was sharp and trim...a big improvement from the monster it had become by the end of the 4th generation. 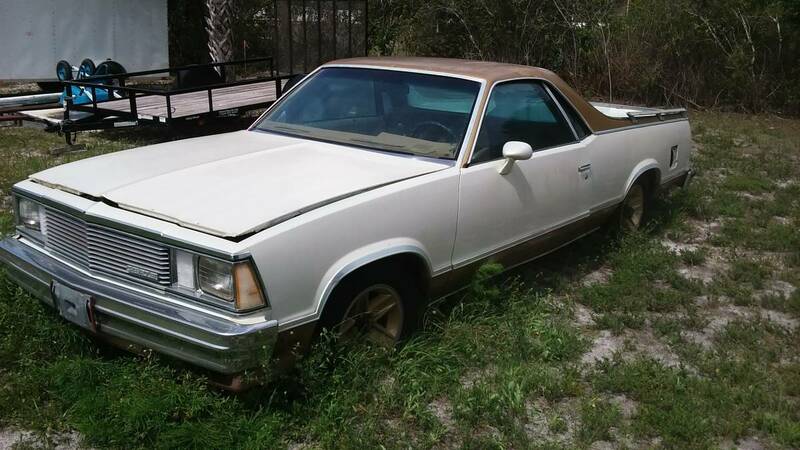 Find this 1978 Chevrolet El Camino Conquista offered for $2,800 in Port Charlotte, FL via craigslist. Tip from Dascpcu. 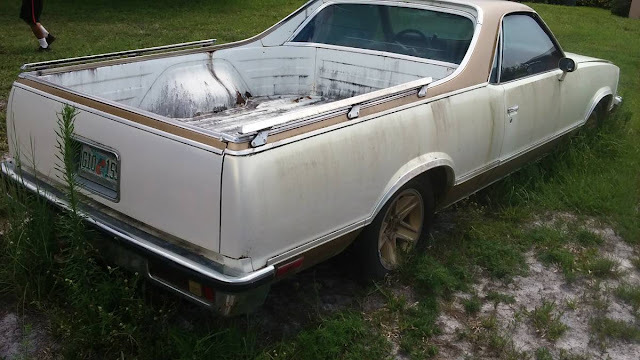 This El Camino looks like it needs a significant amount of work before it gets back on the road...but the seller claims it runs & shifts just fine. That typically isn't the case for vehicles that are parked up to their hubs in dirt...but who knows. Those wheels really work on this. But those weeds make me think runs and shifts means ran when parked a couple of months ago at least. I have been watching these prices are all over the place this is too much better ones out there. The prospective buyer seen running away in the bottom photo may have just seen something bad under the hood. Or perhaps running from the cops because he just did something Floridian? I wonder if you can still get doors for these? You know, Conquista Doors! What a name for an automobile. Why not just call it the imperialist genocide? Did the make a SS version? I wonder if they sold these in Mexico and South America with that name. I think there was a Nationalist Motors Plutocrat SS edition, but sadly not for the Conquista. SS and Conquista trims were mutually exclusive for 5th-gen El Caminos. what would a 1978 Chevrolet El Camino Conquista Edition be worth? runs, transmission is rebuilt, new battery, some surface rust, has a topper on that can come off.